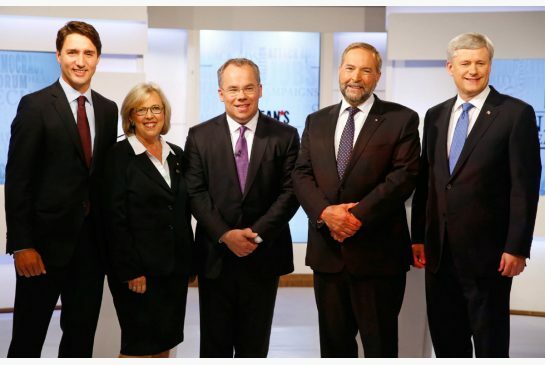 The first election debate of 2015 is over, and it looks like all party leaders seemed to do what they set out for. Harper put out his talking points that will please his base, Justin Trudeau showed himself to be a capable debater, Elizabeth May got the job done in terms of calling out things that were untrue and made herself look quite strong, and Mulcair was able to get in some good shots and Harper while not coming off too abrasive. At every corner Harper was being pushed, and he managed to hold his own quite well, for someone whose goal is to keep his base, not necessarily to get new voters. As expected, Harper was strongest and most comfortable when defending his economic record and talking about national security, and was weakest when he was talking about democratic reform and the Senate. Harper looked somewhat weaker than in previous debates, and at times unable to defend himself credibly. Thomas Mulcair was probably advised to come off as friendly as possible, and at times this felt a bit forced and awkward. He was very reserved, but perhaps too reserved. He was called out on a few things by Trudeau on separatism, as well as by May on his environmental record. Mulcair was not particularly strong when he was on the defence, and didn't always have satisfactory answers, but he did overall come off quite well and very sensible. Justin Trudeau overall did quite well. I think his main problem came at the end with his sputtering final statement, but otherwise he managed to get his points across, and fairly successfully defend his positions. He remains weak when it comes to C-51, and although he tried to explain his position, to a lot of people it won't be a satisfactory stance. He did have a few very good moments when he was on the attack against Harper. Elizabeth May was the most coherent, and the most knowledgeable of the leaders tonight. She came off as being the most confident, and hit the best blows against Harper. She also had the most compelling final remarks. If there was a big winner tonight, it was May. It will be interesting to see if Green support will increase, which might make things difficult for the NDP and the Liberals. Overall, all of them did well, but Harper came off the most tired, and the most threatened, and Mulcair was a bit too weak. Mulcair would be best served by not sitting back quite as much next time. 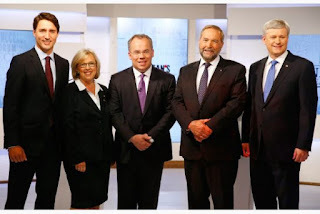 I certainly hope that we will see more debates, and that Mulcair will push Harper to attend more. It would be of a great benefit to have more discussions of the quality we have seen tonight.